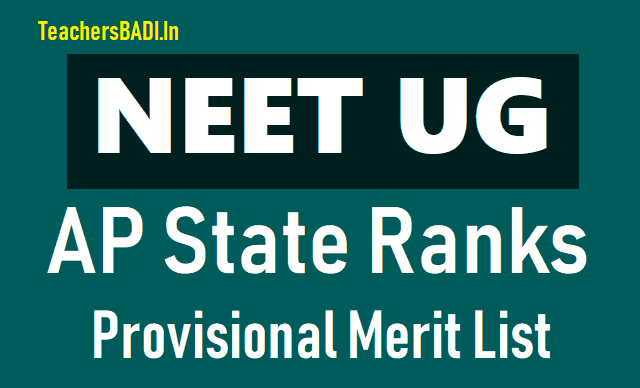 NTRUHS NEET UG 2018 AP State Ranks Provisional Merit List, NEET UG 2018 AP State Ranks Provisional Merit List, AP NEET UG 2018 Provisional Merit Merit List Results, AP NEET UG 2018 State Ranks Merit List, NEET UG 2018 Andhra Pradesh Ranks for NEET UG 2018 Counselling: AP NEET UG Counselling. List of candidates who studied 10+2 in AP and appeared for NEET UG - 2018 , as per the data received from the DGHS, Ministry of Health, Government of India. This is for information of Students and Parents.